Manufactured to ISO 9001 quality and ISO 14001 environmental management standarts. Components 75% Sheep Wool, 15% recycled polyester and 10% polyester binder with a high recycled content. 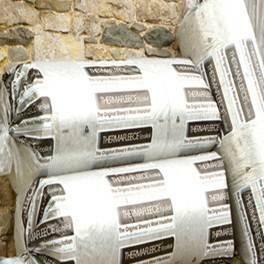 THERMAFLEECE Cosywool is a wool based insulation roll that is quick and easy to install. It contains 75% Sheep’s wool, 15% recycled polyester and 10% polyester binder with a high recycled content. THERMAFLEECE Cosywool is available in a convenient compressed form that significantly reduces transport impacts. Once unpacked, it regains its original thickness to provide effective thermal insulation. Like all THERMAFLEECE products, it is long-lasting, safe to handle and contributes to a healthier indoor environment by regulating moisture and absorbing harmful airborne substances in the home. Thermafleece Cosywool has a thermal conductivity of 0.039W/mK and is available in a variety of dimensions suitable for all your application needs. Thermafleece Cosywool is supplied in roll form with thickness of 50mm, 75mm 100mm and 140mm and is also available in two widths, 370mm and 570mm.